(ptyxis) The pattern of folding and rolling of leaves in a bud. Many types of vernation are recognized (see illustration), which may be useful diagnostically. The leaf margins may be rolled forwards to the upper side of the leaf (involute) or rolled backwards to the adaxial surface (revolute). 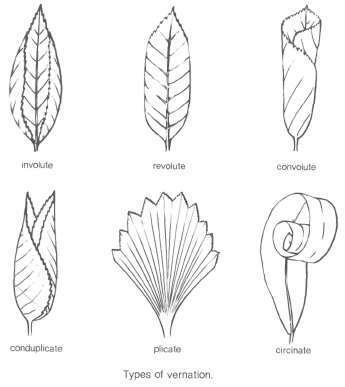 The margin of one side may be wrapped around the other (convolute) or each leaf may be folded in a U-shape, enclosing the next youngest leaf (conduplicate). There may be many longitudinal folds in the lamina (plicate), as in certain palms, or the lamina may be rolled from apex to base (circinate), as seen in most ferns. Compare aestivation.